If you take the time and invest your money in even a small collection of wines, you should try to get the most out of them, consume them under their optimal conditions to enjoy the best flavor, bouquet, and appearance. With the Haier Cellar, the glass door is tinted to protect the wine from light and is double paneled for good insulation. The shelves all glide out to make it easy to gently view and retrieve your wines. 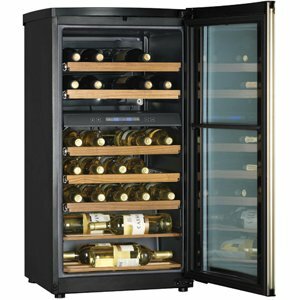 The wine cellar is sized to fit into a bar area or under the counter where your bottles will be close at hand, yet safely out of the way. There's no reason to muddy up the performance of a good product with a bunch of frivolous offerings that don't add any value to the use of the item. What I appreciate about the design of this unit is that there are only necessary features included. The controls for them are very straightforward and simple. The front panel has individual controls for the upper and lower compartments, allowing you to set separate temperatures and providing keys for red or white selections. The bottom of the cellar offers room for larger bottles and Magnums. Should the wine run low, the unit can hold other beverages. Need something smaller? Check out their 6-bottle wine cellar.